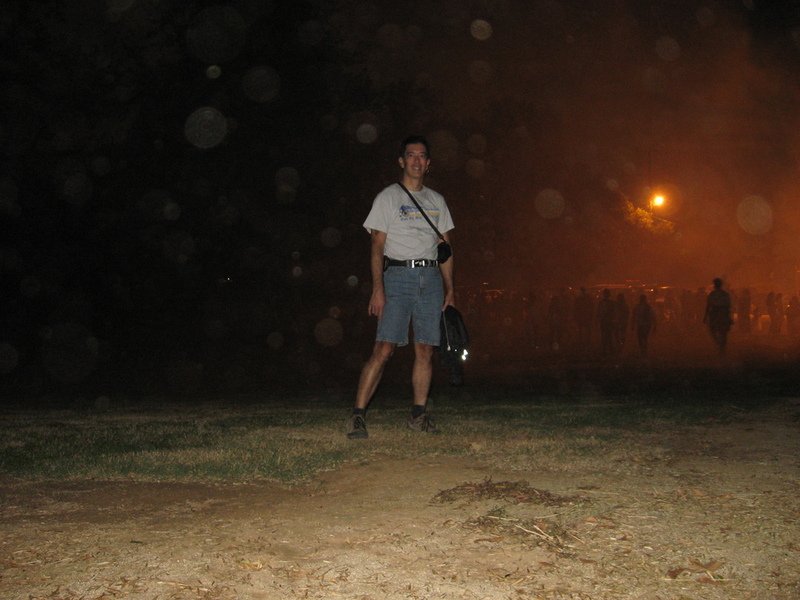 Tonight, I went to Griffith Park for another short night hike. The plan was to hike for a bit and then ride the “Ghost Train” at the Los Angeles Live Steamers. I was doing the night hikes there a lot last spring, but I haven’t been to one since May. The hike itself was pretty pleasant and not too strenuous. But when we got back, the line for the train was very long. So I gave up on that portion of the evening and came home. Still, it was a fun time. 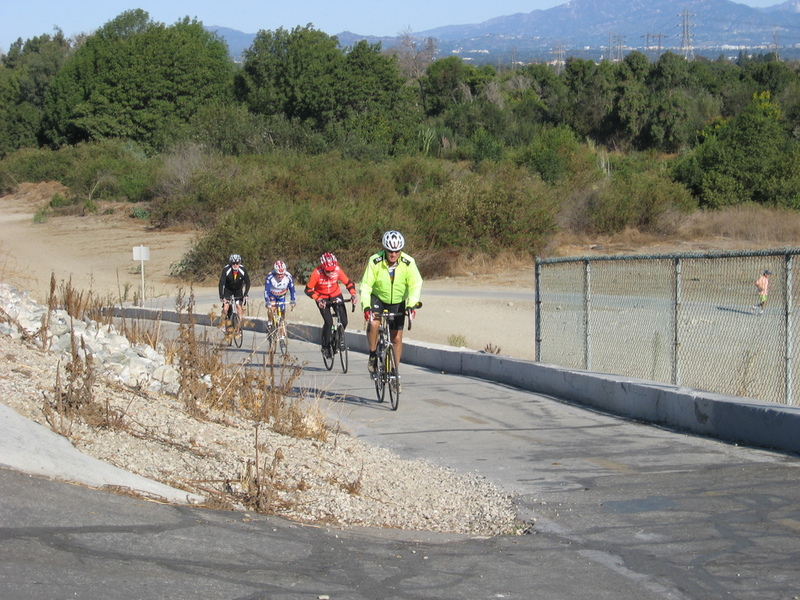 Today’s bike club ride was the “Molly’s Souper” route. This goes from Arcadia out to Upland for lunch at Molly’s Souper restaurant. 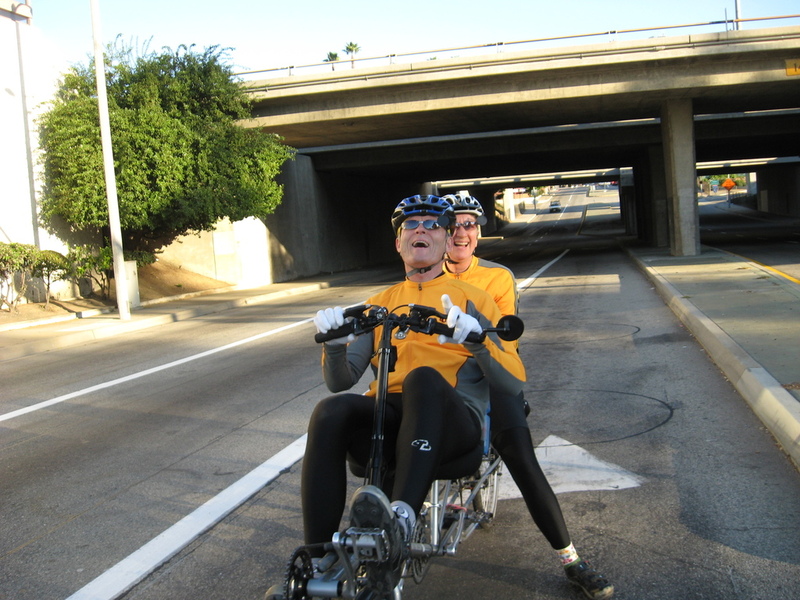 On the way to the start in Arcadia, I saw a couple on a recumbent tandem. They were going pretty fast, so I drafted off them for several miles. 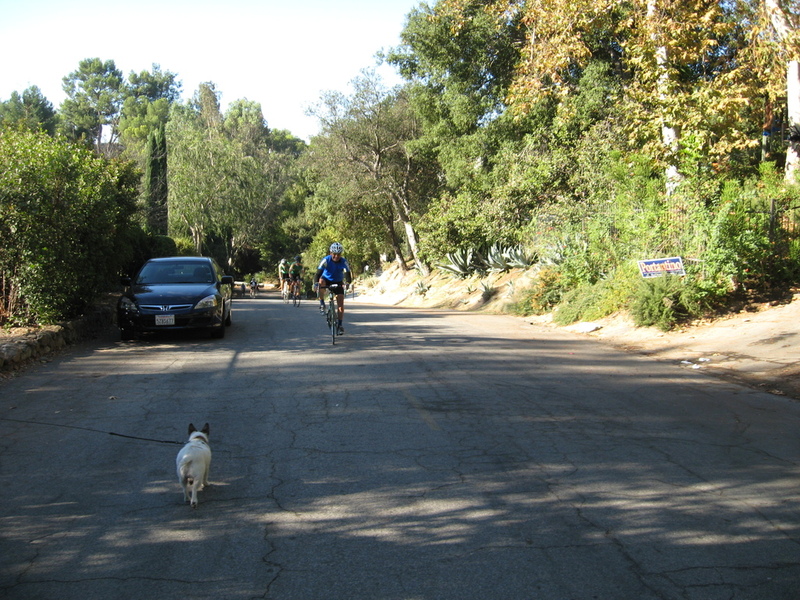 When we started out from the park in Arcadia, we were passed by another group ride. Several people said that they saw Susan in that group. I missed her, since last night she’d said that she was still feeling sick and would not be riding in the morning. But it turned out that Friday night was the turning point, and she woke up feeling better on Saturday and decided to go riding after all. Right after the start, the group broke up into smaller groups going different paces. Gene led the charge in the front group, and I followed along with a few others. 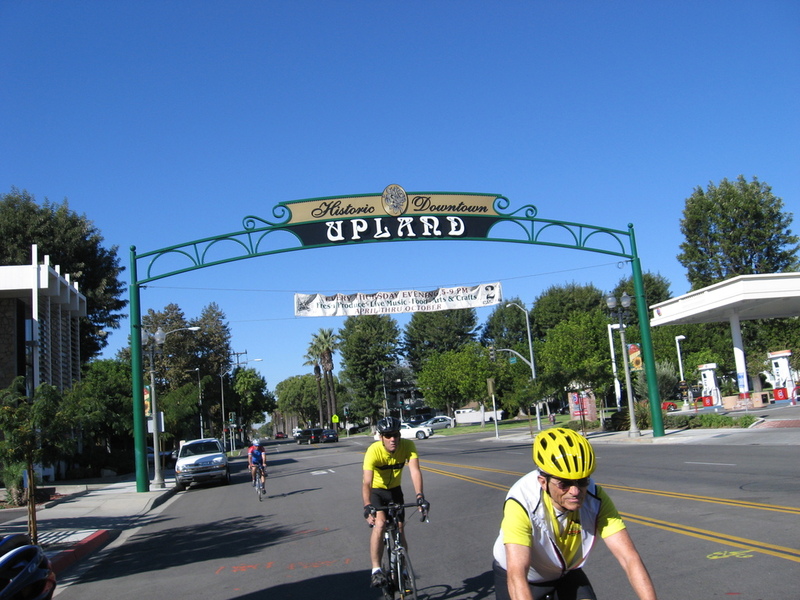 We rode out to Claremont before picking up a new bike path that runs along an old railroad right-of-way out to Upland. It was pretty nice, aside from a few of the major street crossings. 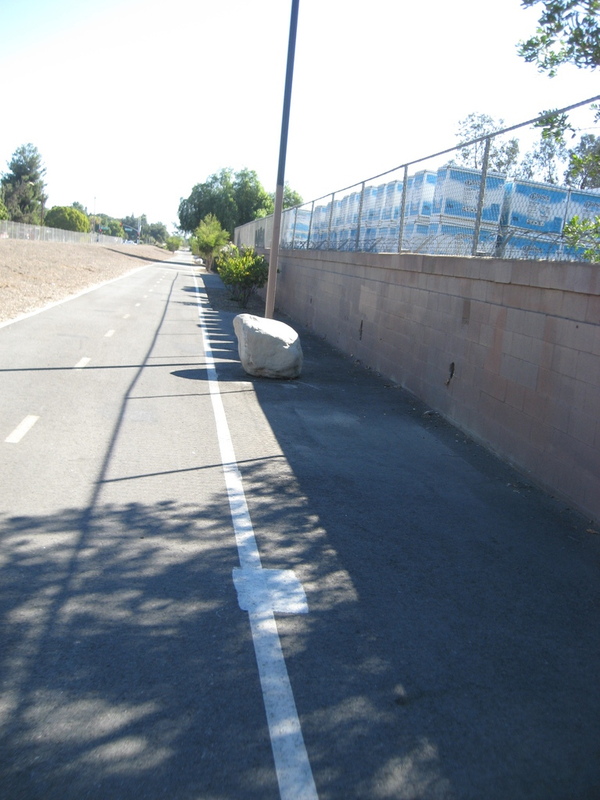 But we were wondering what was up with the big rocks they put in front of every pole along the way. Were they supposed to be cushioning to keep us from hitting the poles? When we got to Upland we decided not to sit down for a long lunch at Molly’s. Instead, we went to a little bakery and had a snack there. 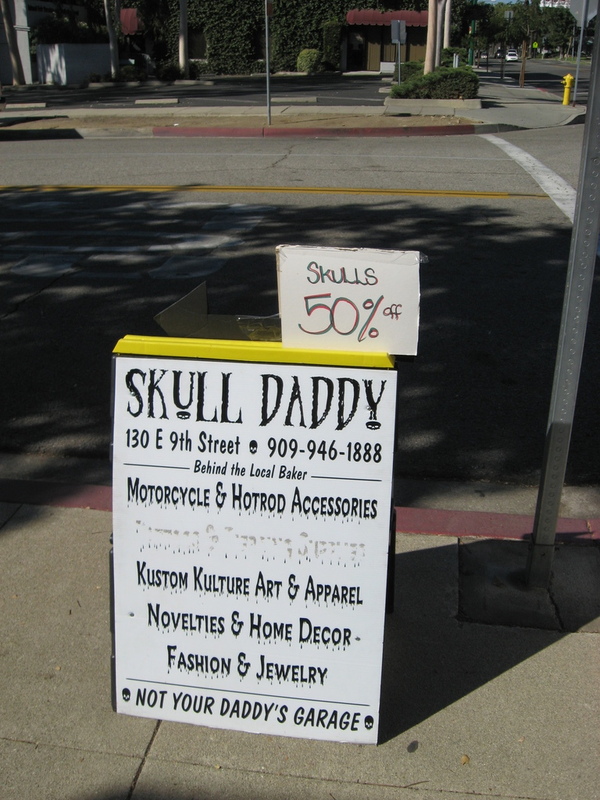 That was where we saw the poster for “Menopause: The Musical”, as well as the sign for Skull Daddy, which was offering 50% off skulls. Yum. The ride back was pleasant, since a lot of it was on long, straight roads with a slight downhill grade. Even though it was a fairly long ride, I was home by 1:00. Today’s bike ride was the “Noodling-7″ route. We did this one last summer. Today’s route was modified slightly to make it a little bit longer, and it was a fun one. As with all the “Noodling” series rides, we didn’t go anywhere in particular. The route had lots of turns, and it involved going up and down a lot of hills. But I think that kind of thing is fun. 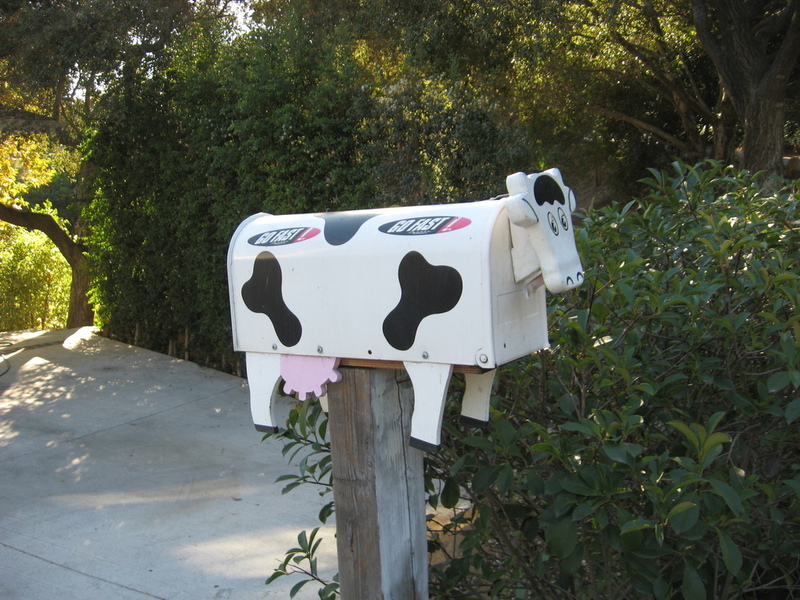 We saw a cow mailbox in La Cañada, which I thought was funny. Then we rode up to the school at the top of St. Katherine, which was interesting in that we usually do that road the other way. Any familiar road will look different when we ride the other way on it. 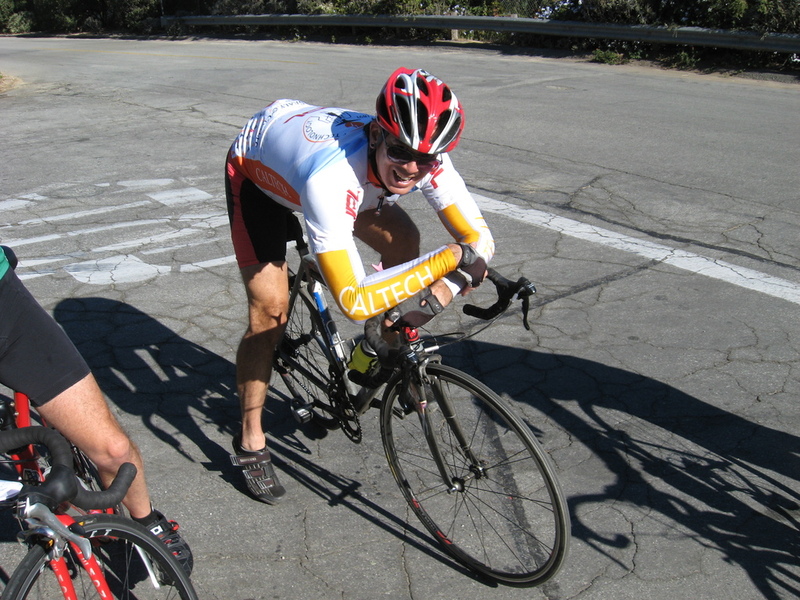 At the top, Silvio took my picture as I panted after beating everyone to the top. Overall, it was a fun ride. On Saturday afternoon, Susan and I went out to Santa Monica to Bergamot Station. 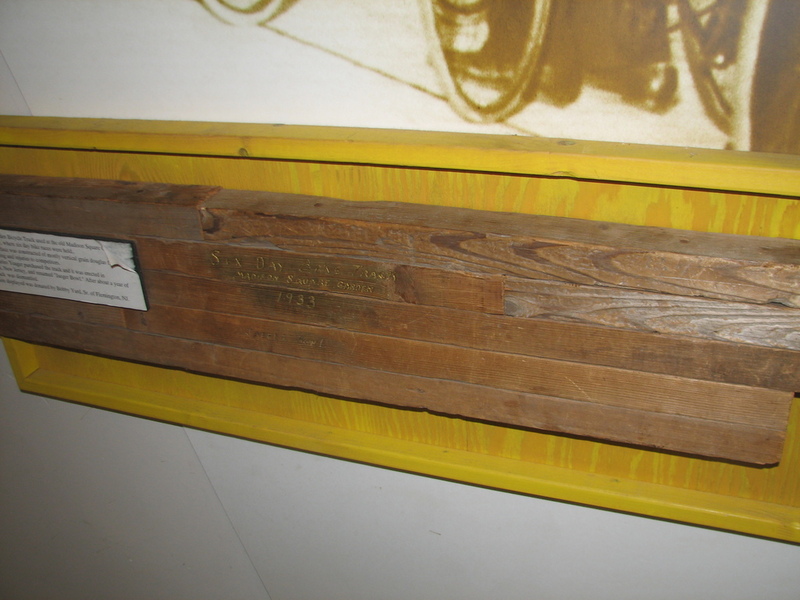 The occasion was to visit Track 16 Gallery for the “No Spitting, No Kidding” exhibit. 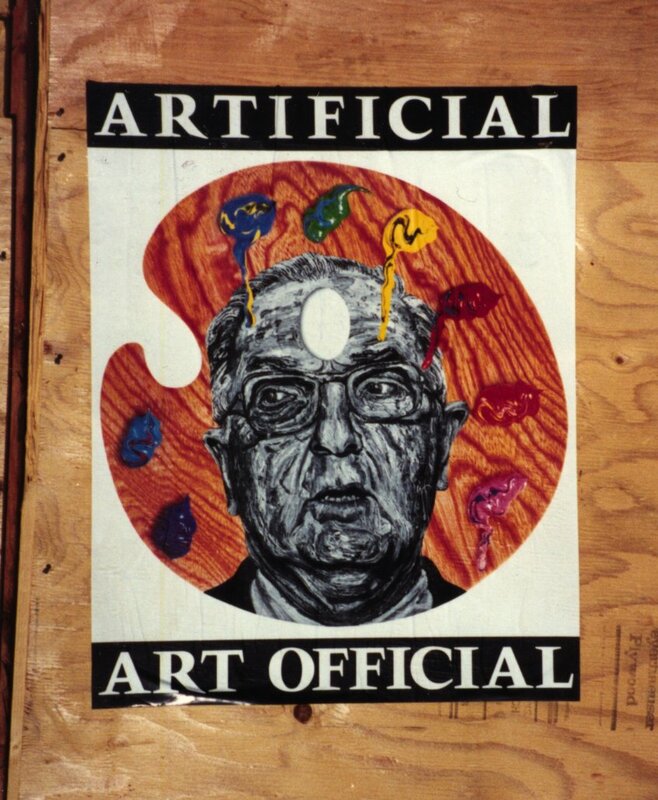 This is a retrospective of Robbie Conal’s work. He was the midnight guerilla artist in Los Angeles during the ’80s and ’90s. 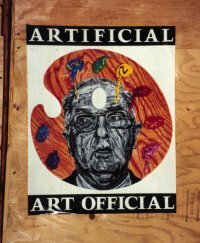 He did satirical paintings of prominent political figures and then his crew would plaster the entire city with posters of them in big overnight raids. I always enjoyed seeing his work around the city, so it was a nice treat to see the original paintings, as well as a lot of other works that never were made into posters. The photo is one of his posters that was on a wall down the street from my old house in Hollywood back in 1990. Afterward, we strolled around and looked in a lot of the other galleries at Bergamot Station, since there are a lot of different ones there. We particularly enjoyed the Gallery of Functional Art. On the way home, we stopped off to visit my friend Kathleen in Westwood. I’d been telling Kathleen about Susan for some time, so she wanted to meet her. That was a fun time. 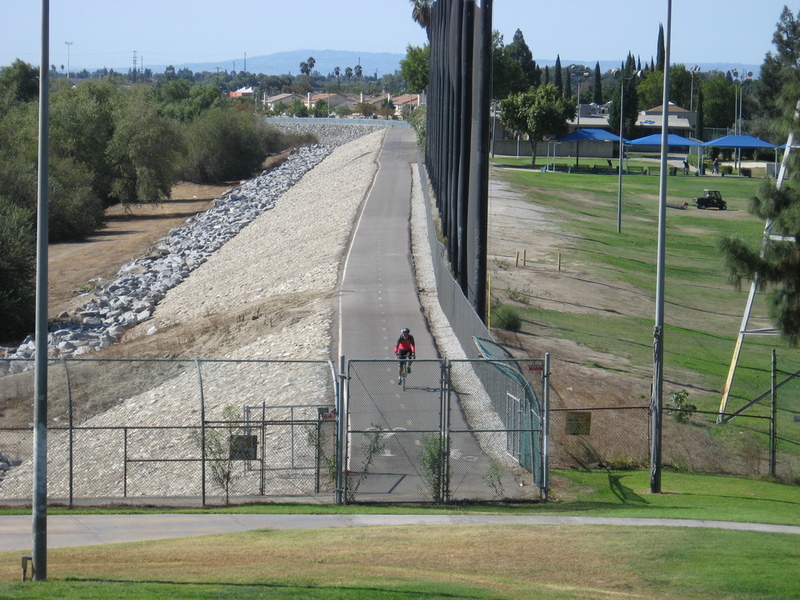 Today’s bike ride was down to Whittier, which is not an especially nice or scenic place, but it’s somewhere to ride to regardless. We last did this ride back in March. And today’s version was very nice, just like last time. And nobody got a flat this time. It was kind of chilly in a fall-in-SoCal kind of way this morning. I wore a piece of bubble wrap as a Hoover Blanket for the first time this season. The ride down there was pretty uneventful. We went pretty fast for no particular reason. And when we got there, we went to Panera for pastries and bagels. The route back was a lot like the route out, even though we took some different streets. 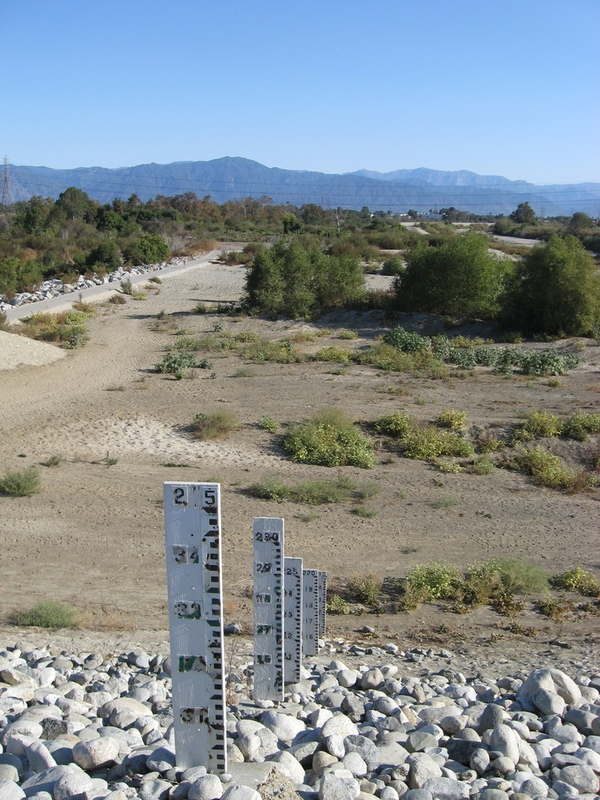 I noticed that the Whittier Narrows Dam had the same kind of flood gauge signs that Santa Fe Dam has. 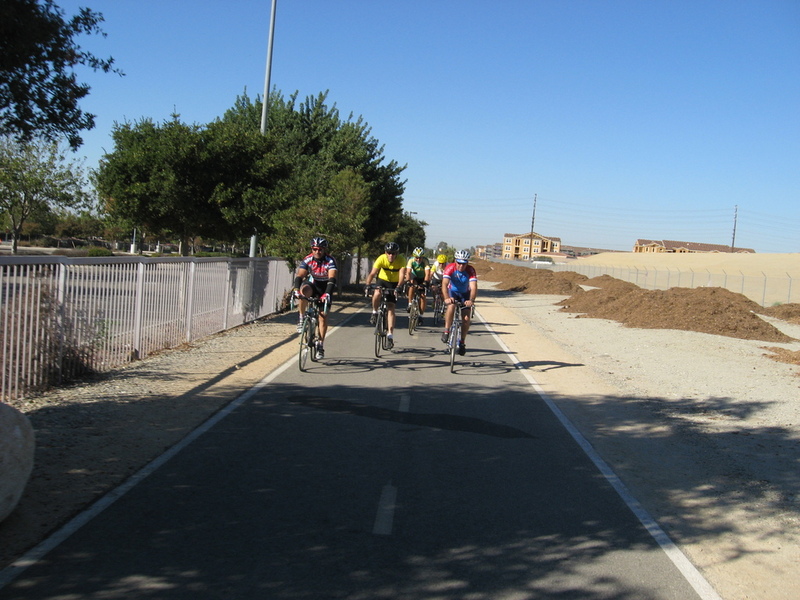 We came back up the San Gabriel River bike path, and we had to walk around where they were doing some construction along the way. Garett had to take his shoes off after that to get the dirt out of them. Overall, it was a very pleasant ride. 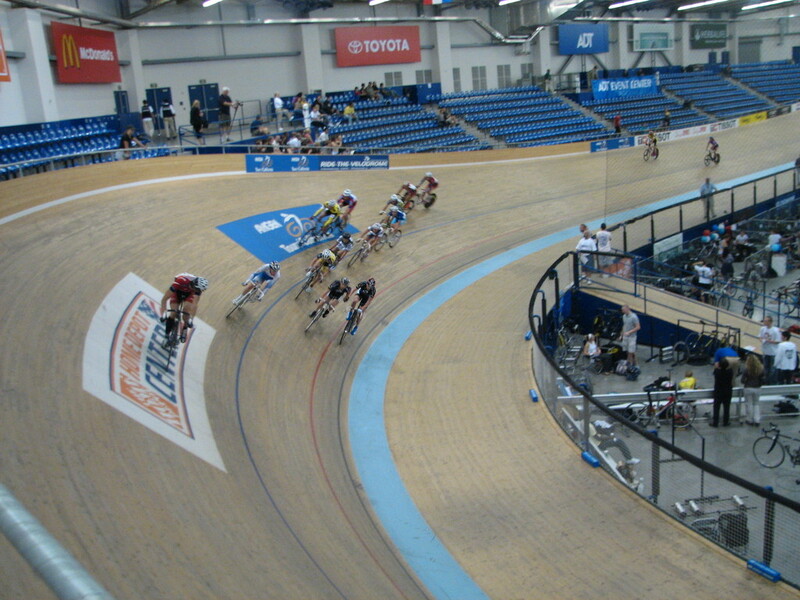 Today, I took Lucinda down to the ADT Center velodrome in Carson to see the last day of the USA Cycling national championships. 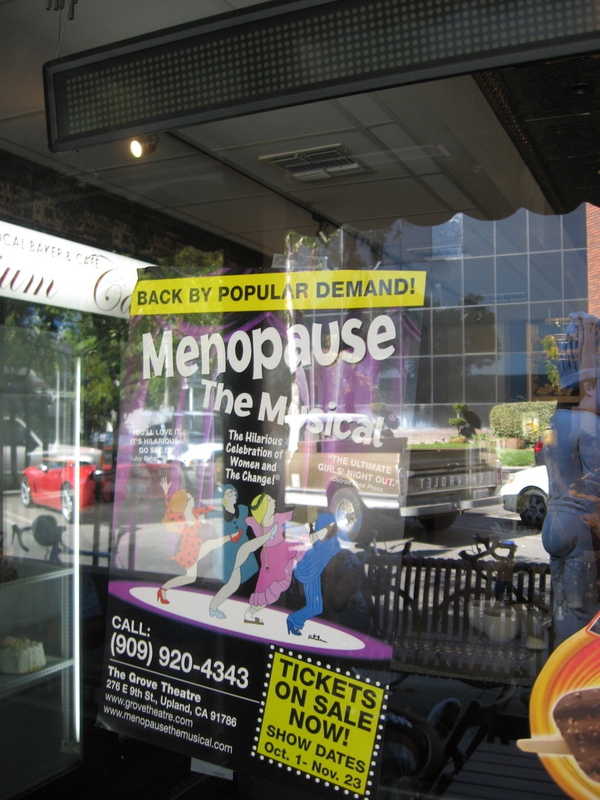 We went to see this last year, as well as the year before, and we’ve always had fun. When we got there, they were doing the finals of the team sprint. After that was the women’s points race, which was a lot of fun to watch. The winner was part of a breakaway that lapped the pack. They each got 20 bonus points for doing that, and that was enough to clinch the victory. 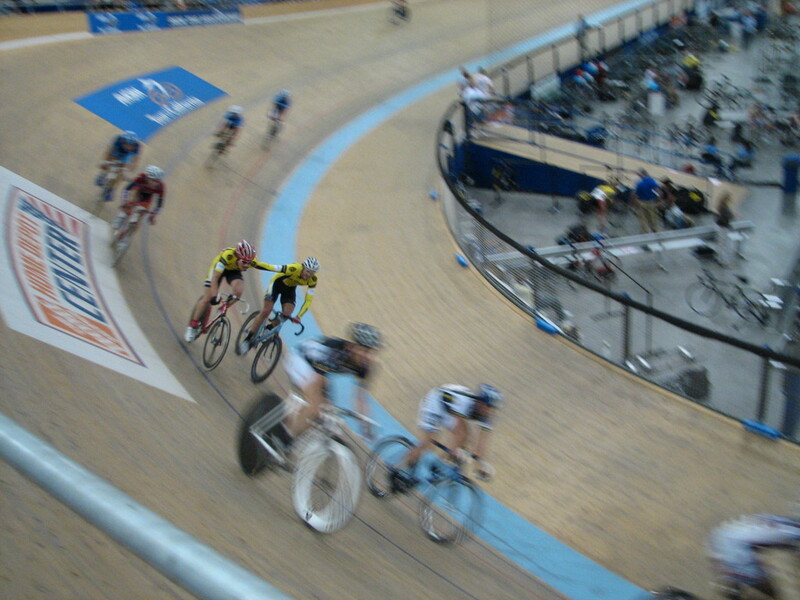 The highlight and last race of the day was the Madison final. There’s a lot of action with the big group of riders doing their exchanges. It’s hard to photograph, since the light inside the building is not so good, but it’s still lots of fun to watch. Lucinda and her friend also got to meet Sarah Hammer there, since she was at a table promoting the OUCH Pro Cycling Team. Today, Susan and I went to see “Religulous“, which is Bill Maher’s sort-of-documentary about religion around the world. And it was easily the funniest movie we’ve seen in a very long time.